Ever since the 1930s, no board game has had the lasting worldwide success of Monopoly. 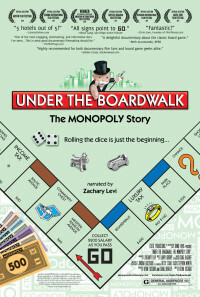 Although it started as a protest simulation, the game evolved to be a welcome wish fulfilling fantasy of being a financial high roller in the Great Depression. In this film, the history of the game is retold with its tremendous popular culture influence and the little idiosyncrasies that grown around it. In addition, we are introduced to various players who are compete around the world for the real cash prizes that go far beyond $200. Regions are unavailable for this movie. Click the "Watch on Netflix" button to find out if Under the Boardwalk: The Monopoly Story is playing in your country.